Located in the heart of Long Beach, The Ebell Club is a one-stop location for couples after a classic, Art Deco-inspired wedding day. This architectural masterpiece exudes Old World elegance and distinct glamour, with a range of spaces for both ceremonies and receptions. It was built in 1924 as a philanthropic women’s club and has since become one of Southern California’s most sought-after event venues. You can select from their two exquisitely decorated ballrooms or the intimate art salon, as well as a beautifully tiled interior courtyard. 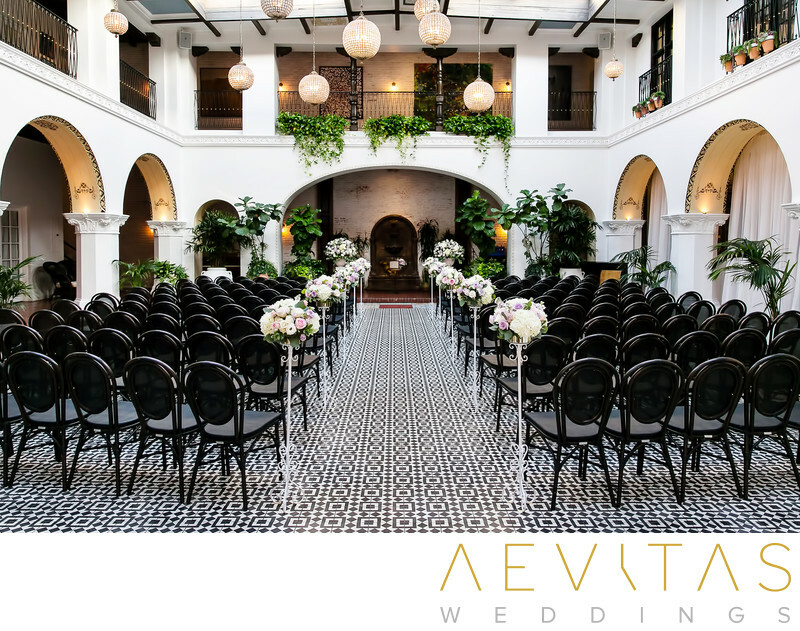 Wedding ceremonies at The Ebell Club Long Beach are held within its opulent courtyard, with an impressive staircase for grand entrances, a Spanish-inspired fountain, whitewashed arches and the capacity to host up to 250 guests. Natural light streams through the windows for beautifully-lit images, and the second floor balcony allows your wedding photographer to capture your ceremony from multiple angles. While you and your newly pronounced spouse enjoy a couple portrait session utilizing The Ebell Club Long Beach’s ornate backdrops, your wedding guests can enjoy cocktail hour in the stately Art Salon. This gallery space boasts brightly painted walls and expansive windows, making it the perfect location for bridal party portraits and family formals also. Receptions are held in The Ebell Club Long Beach’s spacious Grand Hall ballroom, with stunning chandeliers hanging above and plenty of space for lively festivities. The Ebell Club Long Beach prides itself on fine cuisine, with an executive chef and full service catering. Their team of event management staff will help plan and execute your special day, while their highly experienced service staff will attend to your and your guests every need. The Ebell Club Long Beach was named The Best All-Inclusive Wedding Venue in California, and for couples wanting a stress-free wedding day that draws on all the glamour and prestige of Old Hollywood, this outstanding venue should not be overlooked.